A number of translations have been given for this title, perhaps the most common being Springs Flowing over Rocks. The translation I use here comes from connecting the melody with the image at right, which relates to a story told in the Book of the (Liu) Song Dynasty about the 5th century general Xiao Sihua, a famous qin player. 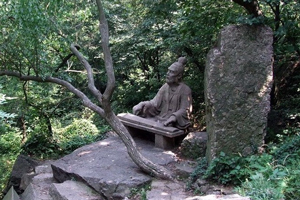 According to the account, Xiao, while in the company of the founder of the dynasty, played qin on a large boulder by a clear spring on Nanjing's Bell Mountain.4 As he played he might naturally have thought of Bo Ya and his flowing streams. The variety of translations for Shishang Liu Quan reminds us that qin music, like good poetry, can evoke a variety of images and meanings. Indeed, one can further enrich the imagery by comparing the present qin melody title to the title Sanxia Liu Quan (Flowing Springs in the Three Gorges),5) a title placed next to Shishang Liu Quan in several melody lists from as early as the 6th or 7th century CE.6 Sanxia Liu Quan is also mentioned in several Tang dynasty poems (see footnote). Further connecting them, both melodies have sometimes been connected in old sources to Bo Ya. Because of the Bo Ya connection, and because springs in the Three Gorges can be very dramatic, it is tempting to imagine that a dramatic Sanxia Liu Quan was once contrasted to a calmer Shishang Liu Quan in the way the modern "72 gunfu" version of Liu Shui (said to describe the flowing streams of mountainous Sichuan) has been contrasted to earlier versions of Liu Shui said to be descriptive of tamer streams of eastern China. Although this and the pairing of the titles on old lists may also suggest that there might have been a melodic relationship between the two, the fact that they are listed next to each other without comment may also be evidence against such a connection. In addition, no surviving qin melodies use Sanxia Liu Quan as a title or alternate title, and none of the extant commentaries or subtitles for Shishang Liu Quan mentions Sanxia. Also, only a few narratives seem to connect Bo Ya himself to the titles; and while some old writings say Sanxia Liu Quan was composed by Ruan Xian, no connection has been made between Ruan Xian and Shishang Liu Quan. Of course, there is no evidence for or against any of the surviving versions of Shishang Liu Quan, the earliest of which is the present one published in 1525, having any melodic connection with the melodies indicated in the old melody lists or the people now associated with it. The second section of the 1525 tablature is called Bijian Lingling. Perhaps not coincidentally the title of the Guangdong school version of this melody, said to date from 1836, is Bijian Liu Quan,7 This version of the melody seems to be newer. This melody was created by Bo Ya. It seems to have feelings for mountains and rivers, allying them with springs and rocks, as if they were hanging cliffs and cold streams, dancing pearls cascading in strips, capturing peoples' imagination. If you continually pay attention to the meaning of the melody, you can tell it has the beauty of the natural sky and earth flowing together. 8 sections, titled;13 the timings follow my recording 聽錄音. 24574.18 only shishang; 7/980xxx; 17762.130 流泉 Liu Quan does not mention shishang. See the text above and the footnote below concerning its possible connection to Sanxia Liu Quan. I have not found any references connecting it to Xiao Sihua, as I do below. Shishang Liu Quan is also written Shi Shang Liu Quan and Shishang Liuquan. Other translations used for this title include Springs Flowing over Rocks, Springs Flowing over Rock, A Spring Flowing over Stones, Mountain Stream Bubbling over Rocks, and more. For more on zhi mode see Shenpin Zhi Yi. This image comes from a webpage called 彈琴石 Playing Qin Rock. There are several more good ones at Panoramio. See also next footnote. Xiao Sihua was becoming General Supervising the Left (in the imperial guard). He once accompanied the first ruler (of the Liu Song dynasty) as he climbed the north peak of Zhongshan Mountain. Along the road there was a large boulder by a clear spring. (The first ruler) told him to play the qin on top of the boulder, and as a result he gave him a silver wine cup and said, It makes me think of elevated thoughts I have had of pines and rocks. This account is quoted almost verbatim in Xiao Sihua's Qin Shi biography. Connecting this story to the melody suggests translating the title as something like (Playing Qin) on a Rock by a Flowing Spring. However, as yet I have not found any references suggesting a specific connection between Xiao and Shishang Liu Quan. As can be seen in some of the online pictures, when the trees lose their leaves one can indeed see a nearby spring; but although it may be a 清泉 clear spring, it does not seem to be a 流泉 flowing spring. On the other hand, the water flow from a spring can be seasonal, as its water usually comes from rain in the surrounding area. The pairing of Sanxia Liu Quan with Shishang Liu Quan in a number of old melody lists (see below) might suggest a connection between the two titles, but there is no direct mention of this in the lists, and Sanxia Liu Quan does not seem to be mentioned in connection with any of the surviving versions of Shishang Liu Quan. Includes the line, "I recall how long ago Ruan Xian composed this tune". Xu Jian, in his discussion of Liu Shui (QSCB, p.177 [Chapter 9]), says that Tang poetic references suggest a connection between Liu Shui and Sanxia Liu Quan. Both melodies have been attributed to Bo Ya, and Xu Jian suggests that the Sanxia Liu Quan attributed to Ruan Xian was actually a version of Liu Shui. But while he finds connections between Sanxia Liu Quan and Liu Shui, he makes no mention of Shishang Liu Quan. This reference lists several Three Gorges including the most famous, the Three Gorges in the 巫山 Wushan district, on the Yangzi river in Sichuan province; it mentions Zuo Si and Li Bai but not Bo Ya (sometimes said to have had his home in Sichuan), the poems above, or anything about a melody. No surviving old qin tablature uses or even mentions San Xia in a title or subtitle. Since the Yangzi as it runs through the three gorges is hardly a spring, the image I have is one of water cascading down from the nearby slopes. This is a particularly memorable image to people who have sailed down the Yangzi during or after a rain shower, though in this case the water is mostly not from springs but simply runoff (quan seems often to refer to the stream coming from a spring rather than the source of the spring itself; thus it may sometimes be translated as "streams"). This reference quotes Ban Gu and Li Bai, but also does not mention a melody or the poems above. 24916.231 only bijian. Bijian Liu Quan is apparently the Guangdong school version of Shishang Liu Quan, said to have been in the lost Ming handbook Gugang Yipu (1836). Thus the Zha Guide listing (40/--/--) of it as a separate melody, giving two occurences: 1828 and 1836, is a mistake. The 1884 preface to Shishang Liu Quan says it was by Liu Juanzi, while Bijian Liu Quan was by Zhu Xi. There are a number of modern recordings: do a net search for Bi Jian Liu Quan. The most popular translation seems to be Flowing Spring Of The Green Brook, but I have also found A Spring Flowing in a [Jade] Green Valley. Zha's Guide 17/173/-- and 40/--/--; the former misses 1623. The recording of a silk string performance by 詹澄秋 Zhan Chengqiu on the CD An Anthology of Chinese Traditional and Folk Music, Vol. 7, is transcribed in GQQJ, but the transcription is strangely inaccurate, leaving out details played by Zhan and/or clearly included in the original tablature. The most easily heard are at the beginning of Section 3, one of the most distinctive passages in the entire piece (at 02.03 of the CD track): the original tablature shows clearly that left hand plucks (帶起 daiqi) from lower positions on the 5th and 7th strings are to be preceded by 逗吟 dou yin: slides interpreted in the recording as quick upwards slides. However, the tablature and transcription as written in GQQJ omits these slides. The same can be heard on a recording of a metal string performance by Wu Zhaoji as well as on a YouTube recording of a silk string performance by Yuan Jung-ping (2016: seems to have been removed). based mainly on Zha Fuxi's Guide, 17/173/-- (plus Bijian Liu Quan 40/--/-- ). "琴苑譜 Qin Yuan" (1670), and daiqi as there, but 1876 seems to add a section (its #5) and expand the last section (#8). (1890; XXVI/440) 9 sections, including 尾聲 coda; 徵音 zhi yin; has preface. (1884; XXVII/338) 11 sections, including 尾聲 coda; 徵音 zhi yin; seems rather diff; no daiqi passage? Return to top, or to the Guqin ToC.